Virginie Papadopoulou studies decompression sickness in scuba divers and using microbubbles to improve cancer treatments. Ninety feet below the Pacific Ocean, off the coast of the Galápagos Islands, Virginie Papadopoulou floats peacefully among hundreds of hammerhead sharks. She watches in wonder, taking easy, steadied breaths from her oxygen tank. Virginie Papadopoulou first learned to scuba dive during a family vacation in Jordan when she was 13 years old. After seeing advertisements across town for lessons and tours, she convinced her dad to take her and her brother on a dive. They were hooked, and have made countless dives since. 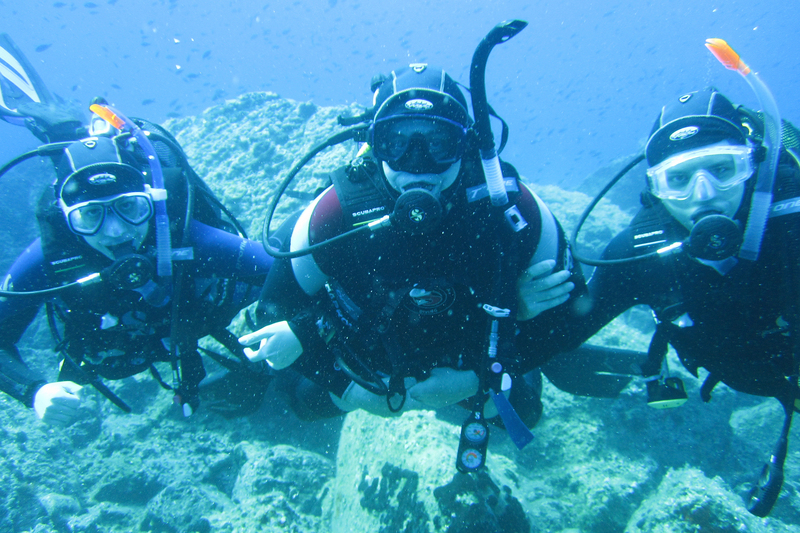 Virginie Papadopoulou dives with her father and brother in Lesbos, Greece in 2010. That passion has led Papadopoulou to the Dayton Lab in the UNC/NC State Joint Department of Biomedical Engineering. She studies decompression sickness (DCS), which affects about 1,000 scuba divers per year. DCS occurs when a diver’s body doesn’t properly expel gas built up due to pressure change. During a dive, the body acts like a storage facility; the longer a diver spends at depth, the more gas is stored in their tissues. As long as a diver stays at depth there is no problem. The issue comes when divers ascend. That gas needs to release back into the bloodstream and expel through the lungs. If divers come up too quickly, microbubbles can form in their blood, causing symptoms like joint and muscle pain, dizziness, fatigue, paralysis, and in some rare cases, death. Despite about 100 years of research on the topic, according to Papadopoulou, few gains have been made. Scientists can create microbubbles with amazing precision, controlling the size, distribution, and quantity of the bubbles, the composition of gas and the bubbles’ shell, and what they target. When it comes to DCS though, researchers don’t understand where the bubbles form, how they form, how big they are, or how exactly they cause problems. One of the biggest mysteries is why dive buddies –– two people doing the exact same dive –– can have different outcomes when surfacing. Furthermore, 97.5 percent of recreational divers with decompression sickness take every necessary precaution, according to Divers Alert Network. In 2011, Papadopoulou was pursuing a master’s degree in theoretical physics at Imperial College London. The course she enjoyed the most, though, had nothing to do with her intended degree — a medical imaging class that covered techniques like MRIs, CT Scans, and ultrasound imaging. At the same time, she was studying to become a Divemaster — the first step of being a certified professional scuba diver. Intrigued by DCS, Papadopoulou began collecting scholarly papers on the subject. The more she read, though, the more frustrated she became. She wanted to investigate further and found a lab at Imperial conducting ultrasound microvascular imaging. She boldly, although she’ll say naively, approached the lead, Meng-Xing Tang, to discuss her interest. Papadopoulou joined the Dayton Lab at UNC as a postdoctoral researcher in 2016. Now a research assistant professor, she continues to study decompression prevention by improving techniques in gathering data. Papadopoulou uses ultrasound to asses divers’ hearts before a deep dive, immediately after, and then every 20 minutes. For divers without DCS, bubble-filled blood is sent from the venous side of the heart to the lungs to be oxygenated, filtering out the gas, and then reentering the heart through the arterial side. Therefore, the ultrasound of a healthy diver typically shows bubbles on the left portion of the heart but none on the right. Although this method isn’t new, Papadopoulou says there are problems with previous findings, like insufficient data. In many experiments, researchers create images at just a few timepoints: typically, immediately after the dive and a few hours later. If a diver has bubbles in their bloodstream it will decrease between these two measurements, but little is known about what happens in the meantime. In a 2018 experiment, Papadopoulou took eight ultrasounds per diver for more insight, and is currently still analyzing results. The second issue is how this data is quantified. Based on images, researchers give a severity grade of zero through five. Most people are not well trained at this, though, and will give vastly different ratings upon reevaluation, according to Papadopoulou. “So, you have the problem of a random grade, a timing that is not ideal, and then you wonder why we have no idea what’s happening,” she says while laughing. During her PhD, Papadopoulou collaborated with a team to devise a more precise way to assess a diver’s heart. The good news is they created a method that is not only more accurate, but also one that anyone –– even those without ultrasound experience – can conduct. The bad news is it’s time consuming. With this technique it takes about 10 minutes to count bubbles, shown as bright spots, in the image of a heart. This may not seem long, but considering her 2018 experiment generated over 1,300 videos, it adds up. At the moment, Papadopoulou and her team are working to automate this process by training a computer algorithm. By collaborating with Divers Alert Network to recruit volunteers to manually analyze images, she hopes — over the course of the next two years — that thousands of videos will be correctly counted and serve as a solid foundation for the algorithm. The study of microbubbles spans out far beyond examining decompression sickness. For decades, researchers have been analyzing the use of microbubbles for a variety of purposes like emergency lung function, cleaning dental plaque, and even restoring memory in Alzheimer’s patients. 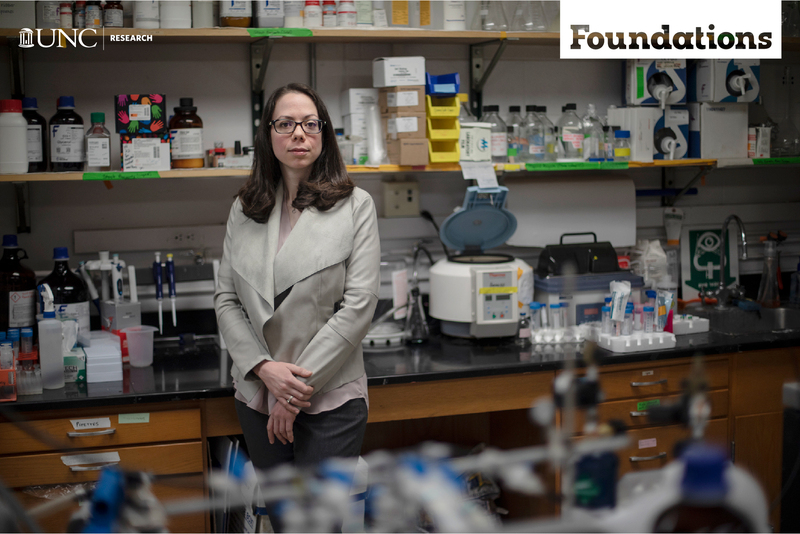 At UNC, Papadopoulou and her colleagues are exploring the use of ultrasound and microbubbles in detecting and treating cancer. During an ultrasound, physicians can see large blood vessels but not blood flow. When microbubbles –– which are a fraction of the size of a red blood cell –– are injected into the bloodstream, though, they reflect and amplify the sound waves, allowing researchers and clinicians to see both the vessels and the flow. The Dayton Lab at UNC is exploring this method by using the dense web of blood vessels surrounding a tumor to identify the mass. Through molecular imaging, the Dayton Lab can use ultrasound to create precise maps of this blood flow in the tumor, honing in on the mass in real time, and enabling doctors to detect cancer earlier, give a defined cancer diagnosis, and reduce the need for biopsies. Another use is targeted drug delivery –– bubbles containing drugs can be sent to tumors through the vascular system, seeking out parts of the mass that indicate blood-vessel growth. Once the bubbles attach to those biological markers, a high-pressured ultrasound can pop them and release the drug. Bubbles can also be used to increase the effectiveness of radiation treatment, which is bad at killing tumors with a low oxygen content. In addition, cells not destroyed become even more resistant to future treatment. In preclinical trials, the lab has successfully improved radiation treatment by targeting tumors with oxygen-filled microbubbles. The idea is to inject the bubbles right before radiation therapy, burst the bubbles with ultrasound waves, and then give radiation when the oxygen level within or near the tumor is at its peak. In May of 2018, the Dayton Lab and researchers at Duke University, the N.C State College of Veterinary Science, the Colorado State University Flint Animal Cancer Center, and the University of Colorado at Boulder were awarded a five-year, $3.2 million grant from the National Cancer Institute to use this technique in treating dogs that have been diagnosed with sarcoma. By teaming up with veterinary schools at NC State and Colorado State University, owners can enlist their dog in the study and receive free radiation therapy. They hope that successful trials will move them one step closer to treatment in humans. In the meantime, Papadopoulou continues to hop back and forth between improving techniques in ultrasound for studying cancer and decompression sickness. These topics may seem vastly different, but to Papadopoulou there is an obvious connection. Virginie Papadopoulou is a research assistant professor within the UNC/NC State Joint Department of Biomedical Engineering and a Divers Alert Network Scholar. Her work is supported by the Divers Alert Network through the 2017 R.W. (Bill) Hamilton Memorial Dive Medicine Research Grant administered by the Women Divers Hall of Fame, and grant #DAN-UNC-1. Paul Dayton is a professor in the UNC/NC State Joint Department of Biomedical Engineering and the Eshelman School of Pharmacy, as well as associate director for education at the Biomedical Research Imaging Center within the UNC School of Medicine. The oxygen microbubble study is supported by the National Institutes of Health 1R01CA228418. This entry was posted in Foundations, Health, Invention. Bookmark the permalink.